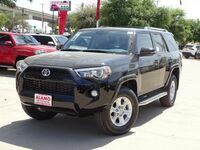 The 2019 Toyota 4Runner has sculpted exterior styling that features flared front and rear fenders that give the 4Runner a cinched waist and athletic appeal. 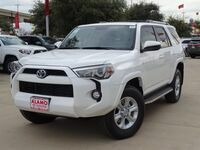 Not only does the 2019 Toyota 4Runner have the eye-catching allure that you are after but it also has the performance, off-road ability, and versatile interior space that will transform your daily driving and weekend retreats as well. 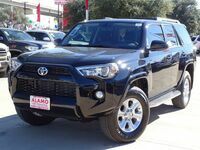 Get to know all of the standard and available features of the 2019 Toyota 4Runner right here below and the 2019 4Runner is waiting for you to take it home at Alamo Toyota in San Antonio, TX today. 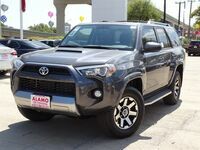 The 2019 Toyota 4Runner is offered in seven trim levels which include the SR5, SR5 Premium, TRD Off-Road, TRD Off-Road Premium, Limited, Limited Nightshade Edition, and the TRD Pro. The standard engine of all seven trim levels is a 4.0L 24-Valve V6 that supplies it with 270 horsepower, 278 lb-ft of torque, and a 5,000-pound max tow rating. This 4.0L engine pairs with a 5-Speed Electronically Controlled Automatic Transmission to average EPA fuel economy estimates of 17 MPG City/ 21 MPG HWY in Two-Wheel Drive (2WD) and 17 MPG City/ 20 MPG HWY in available Four-Wheel Drive (4WD). 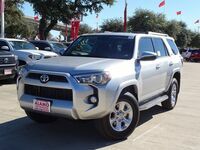 4WD is an option for all trim levels and it comes standard on the TRD trim levels. Inside the cabin there is seating for five or seven people depending on if you equip the 2019 Toyota 4Runner with the optional third-row seat or opt for extra cargo space and an optional sliding cargo deck. When the 2019 Toyota 4Runner gets equipped with the optional third-row seat it has 9 cubic feet of standard cargo space. If the 2019 Toyota 4Runner is not equipped with the optional third-row seat or the third-row seat is folded flat the 2019 4Runner has 46.3 cubic feet of available cargo space and when all rear rows of seating are folded flat the Toyota 4Runner can handle 88.8 cubic feet of cargo. 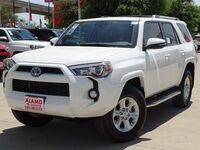 Standard interior technology features of the 2019 Toyota 4Runner include a 6.1” High-Resolution Touchscreen Display with Bluetooth® connectivity and an 8-Speaker Stereo System. 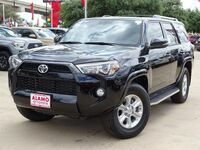 The 2019 Toyota 4Runner also gets loaded with the Star Safety System which equips the 2019 4Runner with Vehicle Stability Control, Traction Control, an Anti-Lock Brake System, Electronic Brake-Force Distribution, Brake Assist, and Smart Stop Technology. 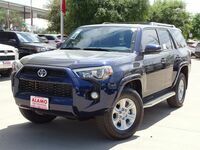 You can take the 2019 Toyota 4Runner for a test drive today at Alamo Toyota to experience everything it has to offer for yourself.